DocMagic and architectural firm Rania Alomar win national recognition for new technology center. DocMagic, Inc., the leading provider of fully-compliant loan document preparation and delivery solutions for the mortgage industry, announced today that its new multi-million dollar facility has been recognized by the American Institute of Architects with a 2013 AIA Institute Honor Award for Interior Architecture. 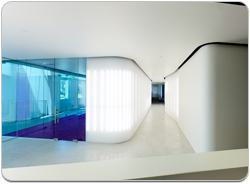 The twenty-five thousand sq.ft., state-of-the-art technology center was designed by Rania Alomar Design & Architecture, West Hollywood, Calif. This is the profession’s highest recognition of works that exemplify excellence in architecture, interior architecture and urban design. Selected from over 700 total submissions, DocMagic and 27 other recipients located throughout the world will be honored at the AIA 2013 National Convention and Design Exposition in Denver. DocMagic has been recognized by the American Institute of Architects (AIA) for one of the 2013 Honor Awards for Interior Architecture. This is the profession’s highest recognition of works that exemplify excellence in architecture, interior architecture and urban design. Selected from over 700 total submissions, DocMagic and 27 other recipients located throughout the world will be honored at the AIA 2013 National Convention and Design Exposition in Denver.